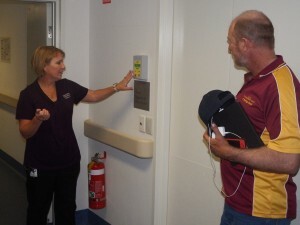 Members of the Gin Gin Community Bank (Bendigo branch) visited Bundaberg Hospital to see two major equipment purchases they have assisted in purchasing. From two separate donations this bank has donated $7044 to the Foundation. 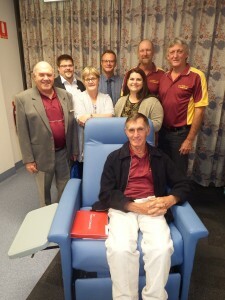 This along with donations from two Masonic Lodge groups – Corinthian Royal Arch Chapter and Athole – Lodge No 53 – has totalled $10,000 towards the purchase of a specialist recliner chair and Wanderers’ Alert Kit. The specialist chair will be used in various wards to encourage critically ill patients to mobilise out of bed to reduce their risk of blood clots and chest infections. The alert kit will be used in Rehabilitation, a very homely environment, which cares for many elderly patients and those who suffer from dementia. These kits allow the patients more mobile independence and permits regular movement of care givers, guests and family members through a protected door entrance. This entry was posted on Monday, August 18th, 2014 at 3:00 am	and is filed under Media Releases. You can follow any responses to this entry through the RSS 2.0 feed. Both comments and pings are currently closed.